Nations and non-state actors are engaged in the race for unmanned systems. The reason is simple: Unmanned systems can take additional risk and are not tied to human endurance, said Paul Scharre, 20YY Warfare Initiative director and a fellow at the Center for a New American Security. “The winner of the robotics revolution will not be who develops this technology first or even who has the best technology, but who figures out how best to use it,” Scharre said as part of a new report on robots in the battlefield. The future of unmanned systems has yet to be written, he said. 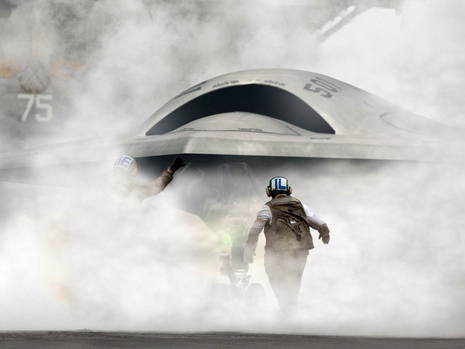 While some of the programs, such as the Navy’s Unmanned Carrier Launched Airborne Surveillance and Strike (UCLASS) show promise, their announced requirements are being questioned by Congress as being too limited. The final request for proposal for UCLASS would work in contested areas with long-range strike are due back this summer, he said. The former Army officer, who worked as civilian concentrating on intelligence, surveillance and reconnaissance and unmanned and autonomous programs and policies in the Defense Department, also cited the value of networking in having autonomous Tomahawk cruise missiles operate as a “swarm” attacking when and where needed and “not a deluge” when launched against a target. They could be launched from unmanned missile barges, overcoming “limits on magazine capacity” shipboard and current forced decisions on how many offensive vs. ballistic missile defense missiles to put aboard. Unmanned surface ships could effectively counter swarming attacks from manned small fast craft, such as those developed by Iran and China, from great distances, he said. It would be a picket-line defense. Scharre several times repeated that many of the items discussed at the conference are not in the program lines of the Pentagon budget. The center’s “Robotics on the Battlefield: Part 2” will be released later this year and “will examine swarming” and “where [unmanned systems] cost more and where they may cost less than manned systems” to help guide decision-making on future spending and policy. The use of these systems also raises ethical questions, Scharre said. The Chinese sent an unmanned aerial system into an area that is the center of a dispute between it and Japan. The Japanese response was to send a manned fighter to observe. Is shooting down an unmanned system an act of war? Is sending an unmanned system on such a mission making it easier to risk war? What about the decision to use force—human-machine interface? Securing communications links and data transmission and reducing bandwidth consumption remain challenges, and interoperability among these systems even in the same military service is not now at hand, several members of the audience said; Scharre agreed. While aerial and marine systems have been moving ahead, unmanned ground systems face a host of challenges, e.g., how to get around obstacles, as common as potholes. Even the driverless Google Car is pretty much restricted to the very precise terrain data it has for Mountain View, California, the company’s headquarters, he said. In a way, the challenges of budget and culture have long been there—when the Navy switched from sail to steam and the Army from horses to tanks. The switch to steam changed “the essence of what it meant to be a sailor, climbing the rigging” to working below decks in an engine room. Having the Navy study risks and benefits of ultra-long endurance radioisotope thermoelectric power for unmanned undersea vehicles. Having the Marine Corps begin developing a medium altitude long-endurance unmanned aircraft, like Predator, to fly from amphibious assault ships for loitering surveillance and close-air support.